1.Combine the tofu marinate ingredients in a bowl and leave for 30 minutes. Bake in a preheated oven at 350 F/180 C for 15-20 minutes and remove. 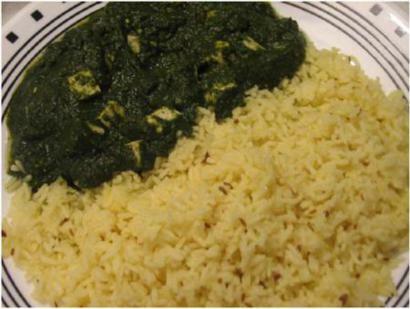 2.Combine the spinach leaves, tomatoes, water and 1 Tbsp ginger in a saucepan. Cook for 10 minutes or until the tomatoes are mushy and spinach leaves are softened. 3.Blend the tomatoes and spinach until smooth. 4.Heat oil in a pan over moderate heat, drop the cumin seeds, green chili, the remaining ginger and sauté for a while. Add asafetida, coriander powder, spinach puree and salt. 5.Add the spiced baked tofu and cook over low heat for 15-20 minutes. Serve hot with rice.